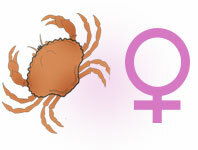 The Zodiac Sign Cancer Woman (June 22 - July 22), Cancer Personality Traits for Female born under June Zodiac signs. Cancer woman does not like to open up to other people, she does everything to keep her inner peace intact. Her companion from the first sight will not be able to understand whether she is a kind and gentle person or whether she is just a fake, secretive and hypocritical woman. In fact, the Cancer woman is very sensitive, she can get upset and cry on every trifle that hurts her, or reopen surging sentimentality, but it's not everyone can notice the tears and suffering of the representative of this zodiacal constellation. Most often, she is pensive and sad, and her bad mood is easily transmitted to those around. If however the Cancer woman is in a good mood, she will openly and extremely have fun, as if being satiated with positive energy for all the subsequent bouts of melancholy. This lady is very economical, she always keeps in mind the thought of the possibility of a black day for her, and eventually saves money not to be in a hopeless situation in the future. Even if the Cancer woman tells others that she has no money, it means only that she has money but it is in the bank or under the mattress, but unfortunately none in her hands. The Cancer woman always looks great, beautiful and smart, has a languid look that attracts a lot of men. When choosing a partner, she is focused primarily on his reliability and stability so that he could defend her, and also on his ability to make money, and even on the content of his purse, because material security to the Cancer woman must have the highest meaning. But she is not at all a mercantilist, as it may seem at first glance. She simply seeks to ensure a quiet life in the future without hazards for herself and her husband. Cancer woman does not like criticism. She can seriously be offended by sarcastic remarks and can even go into a depression. An open criticism can cause protest from her, sometimes unexpectedly violent and loud. Throughout life, the Cancer woman is very afraid to be alone, she cannot endure the situation when she is abandoned or left even for a while. Most often, in family life, the Cancer woman becomes a shadow of the man she loves, she carefully preserves and protects the house, fulfills the whims and desires of her beloved man and completely dissolves in their children. The Cancer woman is not a careerist, she never sets a goal to win high office, but if the wind of change blows towards the direction of an improvement in career, and this lady will be confident in dependability of the company, she will clung to this step as an opportunity to earn more money for the future. The Cancer woman is very afraid of uncertainty, and therefore prefers to set small goals that can be quickly achieved, and not draw distant bright prospects, being contented with the little. In relationships, the Cancer woman may greatly wave to and fro, so she needs a strong partner who is able to direct her, soothe, comfort, and take responsibility for the future. In her personal life with a partner, she prefers to reserve the right to their own space where she can reflect, indulge in melancholy or in her calm hobbies. She does not like noisy companies, her own home and relaxed atmosphere in it are more important to her. Sometimes too many infiriority complexes force the Cancer woman to have great feelings that she is not beautiful enough and not loved. Most often, these are signals to her man that she really needs his support, care and love in order to regain confidence and calmness. Aries are fine until they don't get what they want and then they turn into big overgrown two year olds wailing and stamping their feet...gross. i'm cancer i guess this is true because a lot i fight with my brother and ALWAYS winn.unle im lazy,if i'll fight back but in lazy mood. (dont ask of my lazy mood).Also because i cry over such things too.Lot of stuff that me and a lot that kinda and kinda not me. I read online in a birth chart that Aries people are thoughtless and inconsiderate. Unlike cancer who is thoughtful. You really did a great job hurting my feelings. Now who's better b****. then go to aries woman description..
Am I really that complex and sentimental? I can be tough and rough around the edges to!!! What's up with all these astro websites using Google translate to write in English? Wait, we outsourced the astrology business too? Full description of Cancer Woman, character traits and personality characteristic for female Cancer.